After the stress, bustle and eventual enjoyment of Christmas passes, many still have several days off from work. After a belly full of bowl games, board games, card games and sweets, boredom and restlessness can set in for outdoors enthusiasts. Many perceive the closing of modern gun deer season as the ending to hunting and fishing until the arrival of warm winds next spring. Winter is one of the best times of year to hunt and fish. Time off during the holidays presents a golden opportunity to get outside and enjoy three fantastic outdoors opportunities. Sauger fishing is fun. These fish don’t mind the cold water. You can catch sauger in water temperatures as low as the high 30s. The Ohio River offers arguably the best opportunity to catch them. A new fishing access area on the Ohio River below Meldahl Lock and Dam in Bracken County offers one of the best bank fishing locations for sauger fishing in Kentucky. Sauger fishing from the bank isn’t complicated. A couple of packs of 3-inch curly-tailed grubs in lime green, chartreuse, black and orange or white rigged on 1/4- to 3/8-ounce leadheads catches sauger all winter long. A slow and steady retrieve works best. Use enough weight for the grub to occasionally tick the bottom or you won’t catch many sauger. Bring plenty of leadheads as you will regularly lose them. A crappie minnow rigged on a size 1 Octopus-style hook with several large split shots attached also fools sauger. Fish this rig just above bottom as well. For most Kentucky hunters, dove season is a September only kind of thing. Their minds turn to archery and early muzzleloader deer seasons after the second weekend of the month. John Brunjes, migratory bird coordinator for Kentucky Fish and Wildlife, believes hunters miss a major opportunity to bag doves if they don’t partake in the late segment of the season. This portion of dove season opens Dec. 19 and closes Jan. 10, 2016. Brunjes on occasion brings some No. 7 or No. 8 steel shot loads with him while waterfowl hunting. After the ducks quit flying in the morning, he bags doves from farm fields in the afternoon. He recommends hunting harvested silage fields or fields roughed up by cattle that hold lots of pigweed. Pigweed has many black seeds that doves relish. Feedlots also attract remarkable numbers of doves at times during the late season. They hold waste grains as well as bare dirt, two things that attract doves. The El Nino influenced jet stream so far this fall and early winter brought unusual warmth. A major cold snap over the next few weeks will push many doves from the North into Kentucky, bringing productive hunting. Like sauger, rainbow trout don’t mind the cold either. The coldest water temperatures a Kentucky winter can bring doesn’t slow them down a lick. The 15 seasonal catch and release trout streams spread across Kentucky offer excellent winter trout fishing. Bark Camp Creek in Whitley County, East Fork of Indian Creek in Menifee County, and Trammel Creek in Allen County also hold brown trout. The portion of Otter Creek in Fort Knox Military Reservation receives stockings of brown trout as well. The catch and release season opens Oct. 1 and closes March 31 annually, except for Station Camp Creek in the Red River Gorge National Geological Area which closes May 31. All trout caught during the catch and release season must be immediately released and only artificial lures may be used. These streams in winter typically run as clear as they do all year. Stealth and downsizing your line and lures are of extreme importance. Spinning anglers do well with ultra-light powered rods and reels spooled with 4-pound fluorocarbon line that disappears underwater. Trout strike small gold in-line spinners, little silver hammered spoons, and 1/32-ounce white, grey or black marabou jigs suspended under a tiny bobber. Fly anglers should stick to basic wet flies such as small black wooly buggers, Prince or Hare’s Ear nymphs, small white streamers or tri-colored eggs. 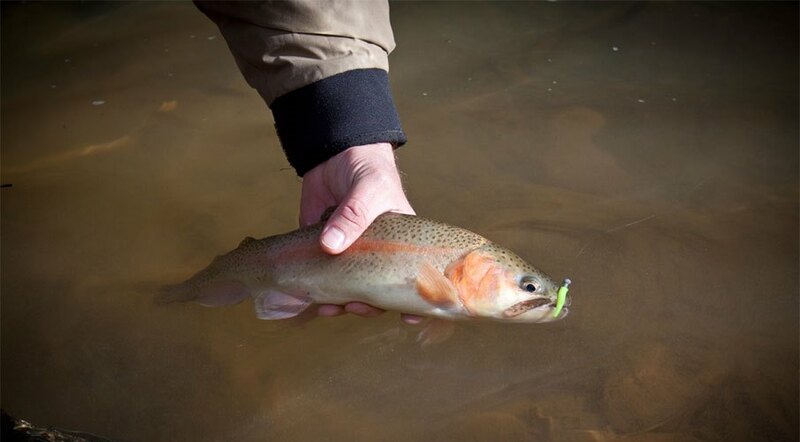 The tri-colored egg fly works exceptionally well on winter rainbow trout in Kentucky. Since most of the trout in these streams run less than 12 inches, a 3- or 4-weight rod provides the most sport. This is especially true on the occasional holdover trout that can run much longer than a foot. For a list of seasonal catch and release trout streams, log onto the Kentucky Fish and Wildlife website at fw.ky.gov and click on the “Fish” tab or consult the Trout Waters section of the current Kentucky Sport Fishing and Boating Guide. Confront your holiday restlessness by hooking a sauger, hunting some doves or landing a trout. Having a glory day in winter feels like you got one over on everybody else.